As part of Dallas Flat Glass Distributors, Excel Glass Systems provides our customers with an extensive range of design solutions, all of which are backed by our superior products, warranties, and customer service. Excel Glass Systems All-Glass Doors from Dallas Flat Glass Distributors deliver a stunning entry into any space, using durable hardware and a variety of glass options. The possibilities are endless for creating an entrance system that allows an increased view of the interior space and added light, while providing the privacy desired. Dallas Flat Glass Distributors offers multiple rail, sidelite, and glass surface treatment options for all your design requirements. 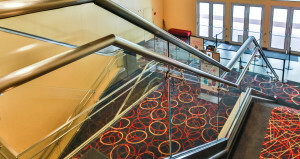 Excel Glass Systems Handrails are favorites of both designers and architects, offering functionality and beauty. The “see-through” properties of glass handrails complemented by subtle color or design create endless enhancement opportunities. Excel Glass Systems glass handrailing systems integrate with ½” tempered or laminated glass panels to create structural balustrades. Excel specializes in providing entrance systems and handrail systems, giving you the set-up needed for a seamless appearance. As an added bonus, we are a one-stop shop and can offer a speedy turnaround on any stock or standard Herculite door system. With our products, your all-glass store-front or new all-glass stair rail will look amazing, be delivered in a timely manner, and be cost efficient to you, our valued client. In addition to our all-glass entrance systems we offer a turnkey solution for all of your frameless shower enclosure needs. Simply provide us with your opening centerline measurements, and we can do the rest. With 2 Forvet machines running daily, we can accommodate any size job and have you ready for the installation process in no time. Being able to offer full-system, turnkey solutions is just one of the great things that makes Dallas Flat Glass a CUT ABOVE the rest.